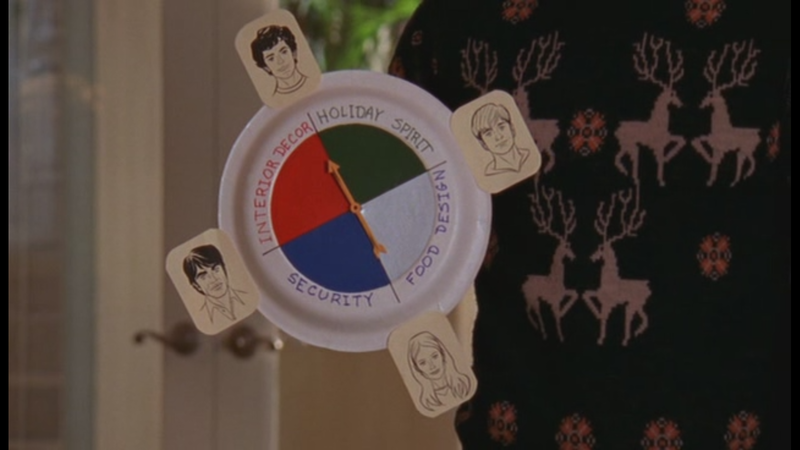 Here is a rare glimpse into a very for some reason forgettable Seth Cohen show prop, No its not Captain Oats, its The Chrismukkah Work Wheel! During the season 2 episode 6 "The Chrismukkah That Almost Wasn't", Seth Ezekiel in his overly hyper Christmas spirit tries to divvy out the elf work (jewcruitment) a little different with this special hand made paper plate spinning wheel contraption (stay tuned for the DIY on how to make this very wheel). Seth never actually spins it but instead lands the arrow on the head of his choosing and begins to give Ryan, Kirsten and Sandy jobs, typical COHEN! Bonus information: Seth makes Kirsten in-charge of the decor (glad it wasn't the cooking), Ryan is in charge of "roping in the Hebrews", which is Ryan's specialty since he is a blonde blue eyed dude. Oh yes and Sandy, yeah he kinda opts out of all the duties in which the group then says "Oy Humbug!"